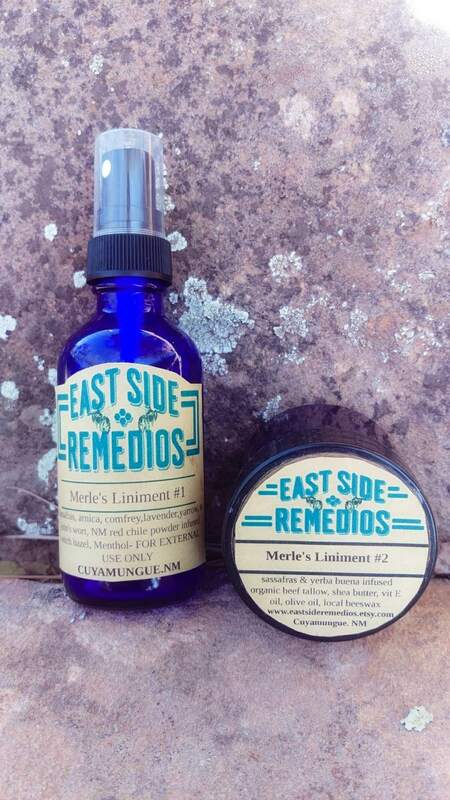 Merle's Liniment #1 comes in a two ounce spray bottle. Great for aching muscles, tired feet, post workout or after a long day at work. We infused witch hazel with foraged sassafras from East Texas, arnica from Montana, lavender, juniper, yarrow and red chile powder from New Mexico and Comfrey , calendula, St. Johns Wort. Menthol crystals are then added for a cooling effect. Merle's Liniment #2 aka sore nose liniment. This is perfect to battle a raw nose that results from the cold winter weather and constant nose blowing. Organic tallow from our family farm, Shea butter and vitamin E oil are infused with sassafras foraged in East Texas and peppermint from our garden to give even the sorest nose relief. Available in a two ounce jar. Both are for external use only and not to be used on cut or broken skin.